I have a bag of garlic ready to plant but haven't figured out where to put it. I don't have as much as you planted so it will just take a little spot. I use a lot of garlic powder but fresh is nice in certain dishes. I thought you were going to do something with the garlic at first to get the baby on it's way, an old English chant around a pot of boiling garlic? It could work, laughter may start things. I never use the powder just fresh but I'm not sure how well this variety will keep so Ill have to see f it will last us the year! We don;t use it huge amounts but it's nice when we do (on sliced roasted potatoes last night with rosemary and garlic was rather nice! We've got 6lbs (5lb of our favourite ,1lb of a new variety) waiting to go in. We tried spring garlic this year...never again, it came to nothing. 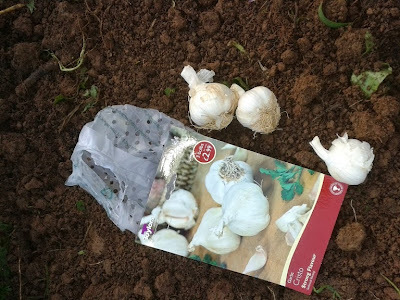 Autumn planted garlic has never failed ...fingers crossed for this planting. PS Has baby any idea that people are waiting for him all over the world!! Thats quite a bit of garlic! You must use it a lot more than we do! My wife and I loved your comment at the end and I told my daughter it not long after she was born! I always plant my winter onions at this time of year. I believe some people plant their garlic on the top of ridges. It helps drainage. 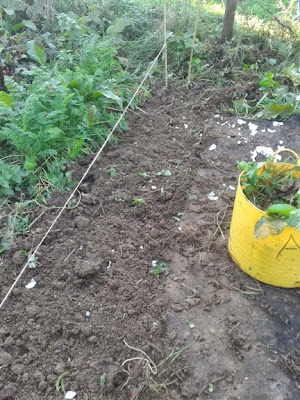 Ridges might have helped with my soil but it is on a slope so that should help (shame it's anorth facing slope but never mind!). I used to plant winter onions but the spring sets from lidi are just so cheap! If I find some to plant that are the right money then they might go in! We went for this vareiety because it says strong flavour - nothing worse than a garlic you can barely taste! How much did you plant? Maybe I should put some more in then as we do use it if we have it and that way I could have another varieity in incase this one doesn't do well here. Cheers for replying!